Remember the Teletubbies-Britain’s most iconic TV show for kids to come out of the late 90s? Much to my surprise and amusement, it turns out that Gary Stevens, a British conceptual artist performing in the Walker’s upcoming show, ‘Ape’, was once a writer and consultant for the popular children’s program! He was kind enough to share his accounts of life in Teletubby land. Thanks Gary, and big hug to you! Be sure to catch Gary Stevens, along with Julian Maynard Smith (Station House Opera) and Wendy Houstoun (Forced Entertainment), in one of three performances of ‘Ape’, co-presented with Bryant Lake Bowl, Red Eye, and Open Eye Figure Theatre. How and when did you begin working for the Teletubbies program? I had been working for Ragdoll, the company that produced the Teletubbies, for some time. Ann Wood, the producer had seen me in a performance called ‘If the Cap Fits’, where I put on more and more jackets and trousers until I looked like a giant onion. I could have planted the Teletubby seed, who knows. I introduced Andrew Davenport [co-creator of Teletubbies] to the company through some pilots and experiments that I conducted. Andrew became a puppeteer with them before conceiving and writing the Teletubbies. So, I was there at the beginning (1997) and before the beginning as a consultant. I sang the theme tune and did some of the voice-over work. Language and slapstick humor are a common thread between your own work and the Teletubbies program. Words and actions endlessly recur in scenes like Tinky Winky searching for Po in a game of hide and seek, just as the characters in your show ‘Ape’ (see video clip here) vie for control in a continual game of repeat-the-speak, both resulting in pure comedy. In ‘Ape’ there is an agreement game. They seem to be having a conversation but they are building on what has previously been said. They do not have any opinions or ideas of their own. They do not know who they are, so they try to get along by doing the safest thing, which is to agree. They play with nuanced copies. They do not own their speech; there is a hint of Tourette’s syndrome. The Teletubbies enjoy speech and the sound of words. Andrew originally studied Phonetics and Linguistics at University College London. There is something childlike about both kinds of behaviour, but there is something alien about both as well. What influenced your own interests in language and comedy? Did you grow up in a humorous family? Yes. I hardly said or did anything straight as a child. In fact, I would get into trouble for assuming that everyone knew that I was joking. Quite often, they did not. Teletubbies nurtures a young child’s ability to develop cognitively and make those early connections to talking, listening, and moving through use of repetition, large movements, bright colors, and a deliberately slow pace. I’m curious to know, how much research went into producing each episode? There was from the outset a repertoire of phrases. They had their own language. Lots of research went into the initial idea that could be drawn on for each episode. It is harder than you think to write for the Teletubbies. I was inclined to introduce some anarchic element that would be ironed out in committee. Ann Wood and Andrew were the people that inhabited the world of the Teletubbies. You and Andrew Davenport, worked together years before the series began in a project of yours called ‘Animal‘. What is this show about and what were your roles? Was this the first time you two met? Do you continue to collaborate? I saw Andrew at the ICA in London performing in a show with Kate France. It must have been about 1988 or 89. I asked them both to work on ‘Animal’ with me. It was a complex show but basically there was some doubt about the humanity of the performer’s behaviour. Andrew was obedient and got very upset if anyone left the stage and waited in a state of agitation for the person to return, only to floor them in an embrace in his excitement and enthusiasm. He did not literarily behave like a dog, but there was something distinctly dog-like about the general behaviour. I also worked with him on another show called ‘Name‘, which involved three performers running around playing far more characters, young, old, male and female. We have not seen much of each other since then. Are there any episodes you’re particularly proud of? The whole project was a brave thing for the company to take on. It was an enormous investment and risk. Nothing quite that big had been attempted in children’s television. Everyone hoped it would be successful of course, but no one anticipated how popular it would become. So there is no individual programme that distinguishes itself for me; it is the concept and conviction that makes me proud of Andrew and Ann. I had very little to do with it. 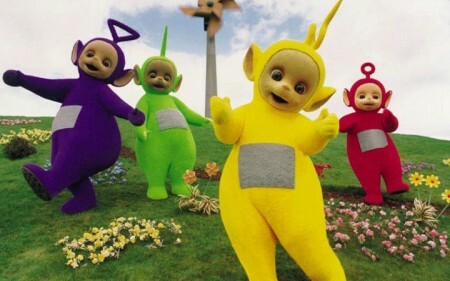 Which character-Tinky Winky, Dipsy, Laa-Laa, or Po is your favorite? Why? I think Laa-Laa is my favourite. I don’t know why, perhaps it is because she is yellow. Each of them has a special personal belonging they identify with: Tinky Winky a red bag, Dipsy a tall hat, Laa-Laa an orange ball, and Po, a blue scooter. What would you say is your most treasured object? I think it has to be my iPhone, I am ashamed to say, although I carry a bag around with me all the time, which is brown and very manly. Many adults not familiar with Teletubbies might find it brain-numbingly slow, super repetitive, and well, just bizarre. Roaming the pastoral Teletubby Land, these psychedelically-colored, baby-talking space people love technology and one another, and spend most of their time playing games and giving hugs. In your opinion, why was Teletubbies such a successful phenomenon in children’s television? I don’t know why it was so successful. I was interested in the idea of lingering on a scene or image so that a child could have time for their thoughts, rather than be led by a fast paced narrative. Coming from a visual arts background, the norm is a still image: photography and painting. Animation and narrative is something to contend with. Someone made a similar complaint about a video installation of mine called, ‘Slow Life’, where everyone moves very slowly in real time. I tried to explain to them that although it was slow for a film, it was fast for a painting. If children are going to watch television then it is better for the child to be creative in response to it. The programme aspired to function as a toy. Not everyone embraced the Teletubbies, including the late Jerry Falwell and Polish politician, Ewa Sowińska who were convinced Tinky Winky was promoting homosexuality to children based on the fact that he carried a handbag. How did you and the creators of the show react to such accusations? The Teletubbies do not have a strong sense of a self-image. They are indeterminate. Tinky Winky does not have a sophisticated understanding of the social, cultural and sexual connotations of the bag. I think he likes it because it is shiny and red.